When you think of magic, I wouldn’t be surprised if you think of wands. Right? Scott Derrickson, director of Doctor Strange, hates wands. Instead he said he spent time hunting for a way to make magic “feel more tactical and real and surreal”, and despite the fact that those last couple of terms are the exact opposite of each other, somehow he manages it in Doctor Strange. Doctor Strange’s magic is rooted in finger-tutting. No, it’s not similar to when you tut your tongue at an inappropriate, mildly racist comment made by an elderly aunt at the annual family reunion. Tutting is a type of street dance which uses angular movements to move the body into geometric positions which are partly inspired by the poses from ancient Egyptian art, with ‘tutting’ taken from tut, in turn nabbed from - you guessed it - King Tutankhamun. After it emerged in the late 1990s, poses (or tuts) have been adapted into intricate geometric finger movements, and it's this aspect which Derrickson leapt on when he was considering exactly how magic would work. Derrickson told Vulture that he didn’t want the kind of passive magic “where you cast a spell and then the camera sits back and you watch something happen”. Instead he imagined action, movement, gestures, an extravaganza of “organic” magic and choreographed flow so although inter-dimensional power was the central focus, it didn’t look like sorcerers were sitting around whilst magic did all the work. YouTuber Jayfunk, who was already famous for his tutting skills, was the choreographer for the movements used to channel magic in Doctor Strange. Tilda Swinton dubbed him a “superhero, for real”, not surprising considering he was the driving force behind ensuring that Derrickson’s vision for the magic in Doctor Strange came true. After featuring in Samsung’s Unleash Your Fingers video which went viral (at the moment it’s got over 10 million views), he caught Derrickson’s eye and tutored Swinton and Benedict Cumberbatch in the way of the tut. Tutting is the perfect midway point for magic which lies just between wands and airy-fairy gesticulating hands. It goes beyond redefining magic to make it plausible and understandable. Because tutting is based on movement and intricate hand gestures, rather than spells jumping fully-formed out of the tip of a wand, you see them being built before your very eyes as fingers interconnect in geometric poses and pull magic into existence. I’m not ashamed to admit that I secretly flick a wand in a certain way in the quiet hope that I can cast Wingardium Leviosa, because there’s few things better than feeling that if you copy characters in films you could conjure up magic out of thin air too. 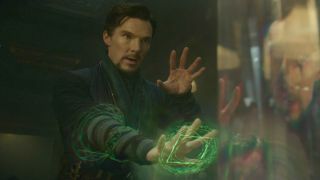 Watching Doctor Strange gives me a thirst for finger-tutting and if I were younger (or merely fearless) I’d assume I could whip up some interdimensional magic with certain gestures. Which kind of proves Derrickson’s suspicion that audiences “love the idea of magical objects and they like learning the rules of those objects and what they do”. For me this is the point where magic stops being a mystic, supernatural entity and starts to become understandable. In my eyes finger-tutting mimics computer code, as the distinct shapes the sorcerers form using their hands correspond directly to the magic they conjure up. Put in the right commands in the right order, and before you know it there’s a band of golden light in front of you. Of course, this isn’t to say I understand magic, which was Derrickson’s primary aim with the Doctor Strange movie. Speaking to CinemaBlend, he said that when it comes to magic “we're not trying to explain it away, and give it scientific understandability. It's magic, and that's what good magic does. It blows your mind because you can't fully understand it”. It’s safe to say that most of the mind-bending, dimension-splicing scenes in Doctor Strange blow my mind, and that’s only if I’m being modest about it. I’d have to spend a lot of time up in the mountains of Nepal if I wanted to even come close to understanding magic, although you don’t need to understand something to use it. I don’t fully understand how computers work, but I know that if I string together the right pieces of code in the correct order I can make the computer do whatever I want. I know what the code does, but I don’t know *how* it does it. The same principle applies to Marvel’s magic - fit together the right hand movements, and pull an ethereal shield into existence, or slice reality so a crystal doorway to another dimension chisels its way out of thin air. I’m certain that if you rearranged their tutting into different sequences, you’d end up with something completely different. Watching The Ancient One as she constructs spells, I couldn’t help but disagree with Derrickson, who said in an interview with CinemaBlend that the sorcerers in Doctor Strange aren’t “out there building weapons”. They are. These supernatural weapons aren’t the same as a gun or a rocket-launcher, and they’re not building them with screwdrivers and soldering irons, but the sorcerers are hauling objects into existence via a comprehensive, transparent process via tutting, just like engineers and manufacturers do when they assemble a machine. Magic in Doctor Strange is definitely mystic, but rooting it in hand gestures means it’s anchored to the real world, making it tangible and intelligible. Which also means that in the privacy of my own home I will continue to gesticulate with an intense look of concentration on my face, convinced that I can conjure up the same inter-dimensional wonders as Doctor Strange. Don’t even try to tell my it’s not possible, because after seeing Doctor Strange, I’m beginning to suspect it is.